Hello there, our dear customers! 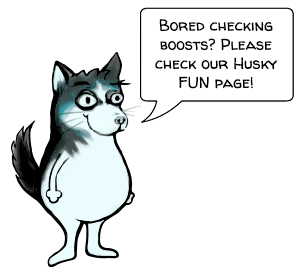 Husky is glad to introduce yet another service to ease your burden. 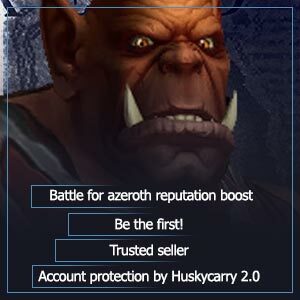 Go ahead to acknowledge the content of an article designed to help you buy reputation WoW or, simply put, rep which can be ordered from any point of US and EU regions! Since the days of vanilla, there has been a parameter that measures your relationships with NPC guilds in World of Warcraft. It defines the way a certain faction treats you. For example, Highmountain Tauren or The Nightfallen. It has a specific value, which can be divided into several parts. It also grants special advantages within that faction. You’d ask: “What is the reason behind this?” – This system includes a large number of bonuses! 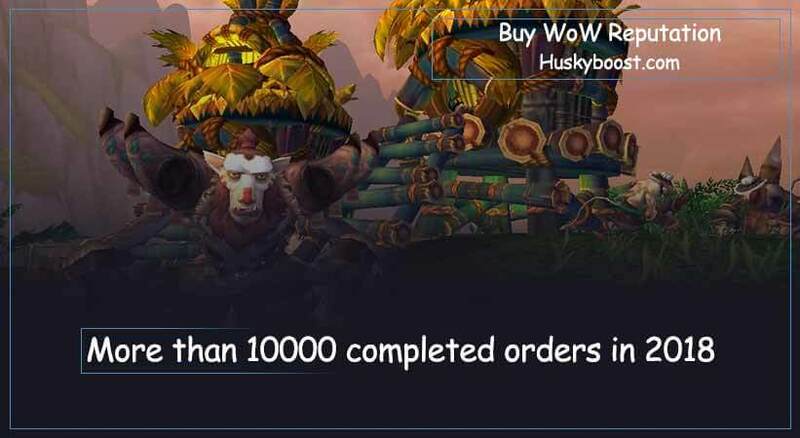 Achievements, mounts, pets, unique items and an opportunity to wear tabards – everything will be yours in WoW if you’d simply buy our reputation boost! Moreover, we provide special bonuses after the service has been carried out. In case if you’ll enjoy it and leave an honest positive review at one of the recommended websites, we will gladly drop the price of your future purchase! Access to unique mounts of selected faction – take a ride to victory! A 20% discount from any merchants – get these consumables cheaper! A tabard – show everyone you’re the boss! Nope. No bonuses at all. Sorry. So what does it take to get that destined “Exalted” next to the necessary faction? Quests completion. 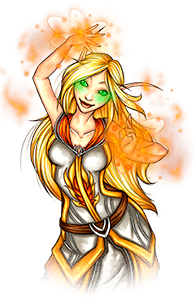 – The main method of receiving rep is completing quests and daily tasks. The number of such quests depends on the faction you are working for. This is a great way to gain some rep and earn money. Even Old World Factions, such as Ironforge, ensure receiving Exalted status in a quite a short period of time. Gathering and contributing materials. – Gathering and contributing resources is a rather costly way, especially if you bought it on the auction. However, it is much quicker! Runic Fabric grants you an opportunity of maxing out reputation with the Night Elves, players all around the world – in EU and in US spend their money to get it in WoW by means of boosting. Just a glance and all the unnecessary missions are completed! Just imagine seizing the possibility of skipping all the boring stuff to cut short to the important parts like exploring new locations, participating in brutal PVP battles or clearing out the raid dungeons with your friends! Farming or grinding. – For killing a monster of a certain type you will gain rep points as well. Honestly, this isn’t the best way if it’s not related to completing a quest. However, it’s advisable to use it if all tasks are already performed. But let’s be honest. Sometimes some farming is just necessary to fuel the flame of your grinder soul! But a lot of people don’t enjoy such gameplay as much so, there are some other options. 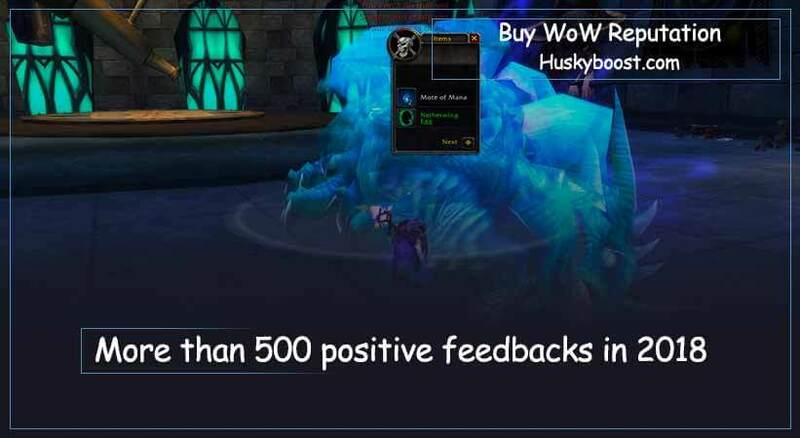 In order to satisfy their needs, we offer various reputation boosts to ease the burden at least by a little bit and make a way for them in WoW! Dungeons completion. 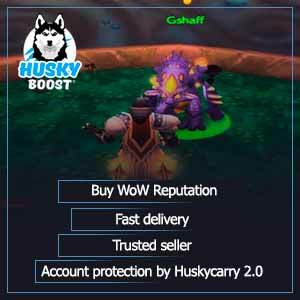 – Yep, it is possible to safely boost your affinity by completing dungeons and raids in WoW without buying anything at all. The Violet Eye can be upgraded only by means of doing the Old Karazhan. Bilgewater Cartel only levels in case you have gone through dungeons with an equipped cape. Do not forget about tabards which are specially made to boost the amount of obtained rep points in WoW. Donations. – Uh-huh, right. You can bribe them. For a decent amount of gold, it is possible to increase your rep. However, it costs quite a lot, so not many players use it. 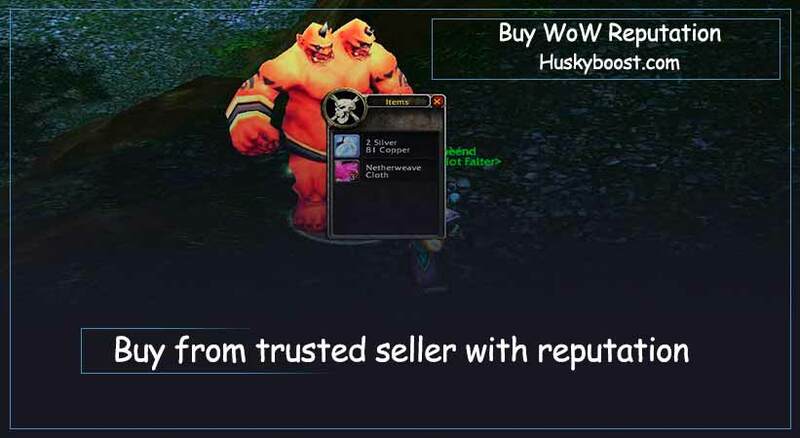 In World of Warcraft, a whole bunch of reps exists – some of them are really easy to increase, while others offer a literal suffering. But for true collectors and adventurers, there are no barriers! 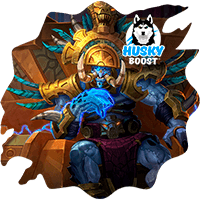 Husky’s skilled team of professional boosters is always ready to help our customers and relieve them from these adversities! Take a single step forward and boost your factional reputation significantly with us! We appreciate your attention. Farewell!